Not all women have perfect bodies; quite a few have problem areas such as an overly large bust, a tummy that's probably a bit too flabby or hips that are a tad too wide. These can make them feel too self-conscious to wear their swimsuit come summertime. Fortunately, there are various choices in slimming swimwear that minimize the appearance of problem areas while maximizing the best of one's assets. It has been long-standing advice from fashion experts that wearing a bathing suit that has one solid block of dark colour can make someone look skinnier. There is certainly no shortage of swimsuits in black (1), dark grey or navy. And just because a swimsuit is all one colour does not mean it has to be boring or unsexy. Shirring in the waist area, belts, and an attractive or unusual cut can make a bathing suit -- and the woman in it -- more eye-catching. Some full-figured women make the mistake buying a swimsuit that covers up too much, in the belief that it's better to keep everything hidden. But according to Glamour magazine's swimwear consultants (2), doing this could actually emphasize a problem area. Boy shorts, for instance, are not recommended for those with large hips since they tend to make the hips look even bigger. A bikini-style bottom, but not one that's tied with strings, is recommended instead. A vee or square-cut low neckline is also advised for those who want to de-emphasize a large tummy or wide hips. The neckline draws attention away from those problem areas and showcases a nice pair of shoulders and the bust-line. Scuba-style bathing suits (3) are also popular slimming swimwear options. They fit snugly to the body and make the wearer seem skinnier because of the vertical lines on the design and the high-cut bottom that enhances the appearance of long legs. So-called skirtinis, or a bathing suit whose bottom is overlaid with a short skirt, can also give a slimming effect. Swimwear with a high Lycra spandex content is recommended since they provide great support and make flabby areas seem smaller and firmer. 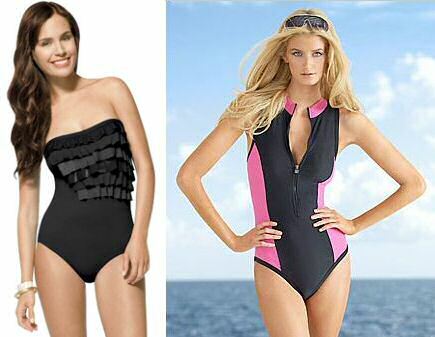 Miraclesuit and Spanx by Sara Blakely are two brands whose bathing suits flatter the figures of plus size women. There are numerous other brands that offer slimming swimsuits. Some that have been recommended by O, The Oprah Magazine (4) are Lands' End, ShapeFx, SlimPerfect Fashions, Slimsuit by Carol Wior, and Inches Off.